The first thing that pops up in my mind as I hear the word Black Forest is the delicious and famous black forest cake. This cake is usually made with chocolate cake, cream, cherry fruit and 'kirschwasser' (kind of alcohol contained beverage which is made from sour cherry). It was already claimed to have originated in 16th century from the famous German's Black Forest (Schwarzwald). Unfortunately, as we visited Freiburg (a city in southern part of Black Forest), we could not find a patisserie or confectionery which specially offers this treat. We could find it in supermarkets though, but it felt quite ordinary. It seems that no one can enjoy a black forest cake in the famous Black Forest. Instead of the cake, we tried to find another specialty in this area and found out that Black Forest is also famous with their wood carving. 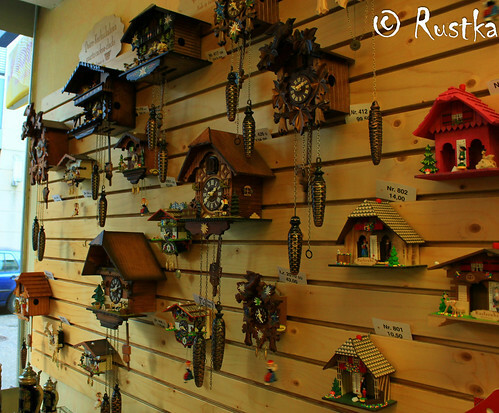 Among them, the cuckoo clocks are mostly known (as we can see frequently in movies, cartoon, etc). It's an antique clock, initially made in Black Forest. The designs are varied from time to time as well as the prices. I found a souvenir store in Freiburg which sells them with high prices. However, it was quite amazing to see the designs and the engravings which were mostly done by hand. The prices range from tenth to thousand euros depending on the size, function and also the feature. We only managed to buy its miniature as a refrigerator magnet for only 6 euros. 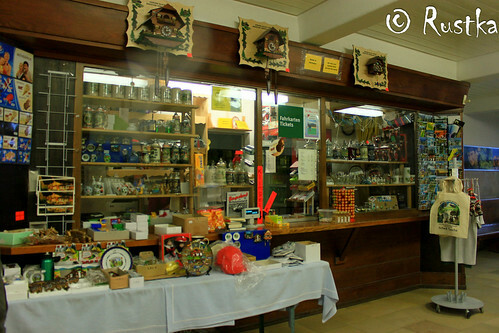 From our experience, there were other stores which offer lower prices such as that in Schauinsland (a mountain in Black Forest) or in the tourist information or the Kiosk in the Freiburg main station. Their traditional costumes were also worth to see and become characteristic of this area. 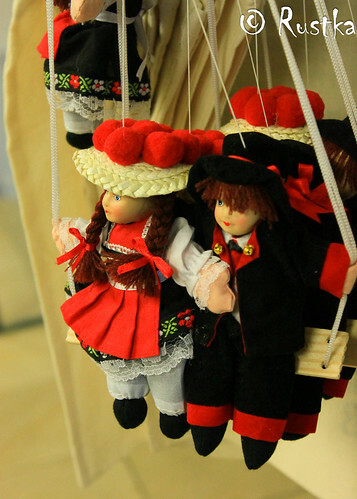 I saw some souvenier store selling dolls with their traditional outfit. Usually the women from this area wears a hat, called as 'bollenhut'. It's a hat with 14 balls on it arranged in circle, which is originally made from woll. This hat in reality can have weight up to 2 kg and the color of the ball has special meaning. If it is red, the hat is dedicated for single woman (girls) but the black one should be worn by married women.